Hello everyone and Happy Saturday! Although I try to typically post on Sundays (just for my own sanity's continuity and no other reason), I really wanted to do a salute to our veterans, who have so long protected our country at whatever the cost may be. 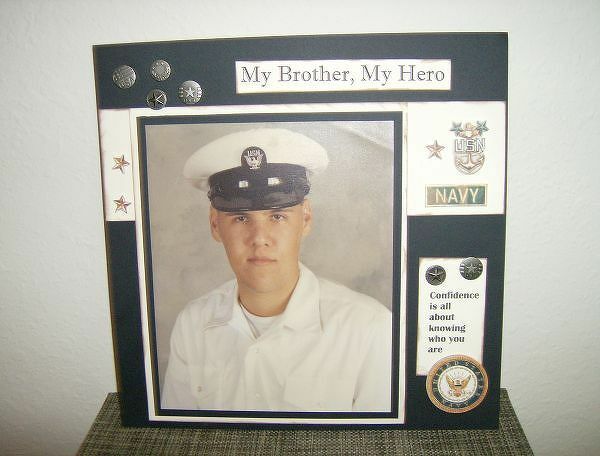 I just so happen to have a veteran in my family; my big brother Tim. Or, as I call him still, Timmy. 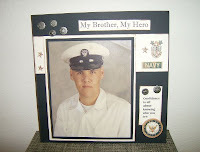 :) He has been my personal hero my entire life and I am proud to call him my brother. His service, as well as all of the other veterans who have, do and will work for our country, sometimes came with a price tag attached. In many personal, professional, emotional, intricate ways, our veterans have given up so much for us to be able to keep our freedom, without us even having to bat an eye. There is no cost for us; just our veterans and their families. Really, I have very fond memories of my brother, who thankfully is one of the good guys still. I can remember very early days of him protecting me, feeding me, talking to me, taking care of me, and just being there. He even came all the way to my apartment from his house (which was a bit of a drive) to vacuum for me after I had my neck surgery and couldn't do it myself. HA! How can a brother be mean and still do that? I did this layout one day several years ago while sitting back and reflecting on some personal moments. I hope it does justice. While I've always been appreciative of my big brother and have loved him beyond words, I am also very proud that he chose to serve our country, along with many other men and women. They have all given something, and I hope we all have been able to learn from them, appreciate them, and most of all, support them. They are why we are free. Card stock by Stampin' UP; Metal embellishments by Memory Makers; 3d embellishments by K & Company; Ink by D.O.T.S. What a touching tribute to your brother. Your layout is beautiful. thank you for sharing your story and tribute to your brother! your layout is so special! Thank you Mary Pat. :) He is a very bright spot in my life.